Sensu is a monitoring tool written in Ruby that uses RabbitMQ as a message broker and Redis for storing data. It is well-suited for monitoring cloud environments. Sensu connects the output from "check" scripts with "handler" scripts to create a robust monitoring and alert system. Check scripts can run on many nodes, and report on whether a certain condition is met, such as that Apache is running. Handler scripts can take an action like sending an alert email. Both the "check" scripts and the "handler" scripts run on the Sensu master server, which is responsible for orchestrating check executions among Sensu client servers and processing check results. If a check triggers an event, it is passed to the handler, which will take a specified action. An example of this is a check that monitors the status of an Apache web server. The check will be run on the Sensu clients. If the check reports a server as down, the Sensu server will pass the event to the handler, which can trigger an action like sending an email or collecting downtime metrics. In this article we will be installing and configuring one Sensu master server and one Sensu client server. One master node running Ubuntu 14.04. This is the node you will use to view all of the monitoring data. At least one additional node that you want to monitor, running Ubuntu 14.04. Create a sudo user on each host. First, create the user with the adduser command, replacing the username with the name you want to use. This will create the user and the appropriate home directory and group. You will be prompted to set a password for the new user and confirm the password. You will also be prompted to enter the user's information. Confirm the user information to create the user. Next, grant the user sudo privileges with the visudo command. Save the file and switch to the new user. Update the system packages and upgrade them. First, we will set up the Sensu master server. This requires RabbitMQ, Redis, Sensu itself, and the Uchiwa dashboard, along with some supporting software. Add the RabbitMQ source to the APT source list. Download and add the signing key for RabbitMQ. The RabbitMQ service should start automatically. If it doesn't, start it with the following command. Sensu uses SSL for secure communication between its components and RabbitMQ. Although it is possible to use Sensu without SSL, it is highly discouraged. To generate certificates, download Sensu's certificate generator to the /tmp directory and generate the SSL certificates. Create a RabbitMQ SSL directory and copy over the certificates. Create and edit the /etc/rabbitmq/rabbitmq.config file. Add the following lines to the file. This configures the RabbitMQ SSL listener to listen on port 5671 and to use the generated certificate authority and server certificate. It will also verify the connection and fail if there is no certificate. Create a RabbitMQ virtual host and user for Sensu. Change the password (pass). You'll need this password later when you configure the Sensu server and the clients to be monitored. Add the sources and keys to install Sensu. Install Sensu and Uchiwa (Uchiwa is the monitoring dashboard). Sensu needs the secure connection information to RabbitMQ. Make an SSL directory for Sensu and copy over the generated certs. 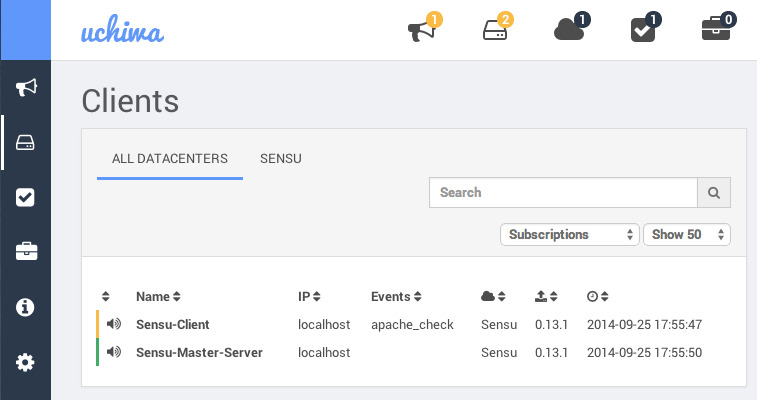 Now all of the components for Sensu monitoring are installed. Now we need to configure Sensu. We'll create individual configuration files in the /etc/sensu/conf.d folder for easier readability and management. Unless you've configured the services and components mentioned in the config files on separate machines, you can leave most sample values shown below unchanged. Alternately, /etc/sensu/config.json.example<^> is another example configuration file you can copy and use to configure Sensu. Create and edit the rabbitmq.json file. Add the following lines, which will allow Redis to connect securely to the RabbitMQ instance using your SSL certificate. The user and pass should be the ones you set for the RabbitMQ virtual host. Create and edit the redis.json file. Add the following lines, which include the connection information for Sensu to access the Redis instance. Create and edit the api.json file. Add the following lines, which include the connection information for Sensu to access the API service. Create and edit the uchiwa.json file. Add the following lines. These include the connection information for the Uchiwa dashboard to access the Sensu API. You can optionally create a username and password in the uchiwa block for dashboard authentication. If you want the dashboard to be publicly accessible, just leave it as is. In this example, we'll have the Sensu master server monitor itself as a client. So, create and edit the client.json file. Add the following lines and edit the name value for the Sensu client. This is the name for the server that you will see in the Uchiwa dashboard. The name cannot have spaces or special characters. You can leave the address value as localhost since we are monitoring this server. We will be creating a similar file again later for every client host to be monitored. Enable the Sensu services to start automatically. At this point, you can access Sensu at http://ip-address:3000. You will need to install Sensu on every client machine to be monitored. SCP. Replace user and IP below with the sudo user and IP address of the client server. On the client to be monitored, add the Sensu key and source. You need to provide the client with connection information to RabbitMQ. Make an SSL directory for Sensu and copy the certificates in the /tmp folder that were copied from the Sensu master server. RabbitMQ virtual host on the Sensu master server. Provide configuration information for this Sensu server by creating and editing the client.json file. Add the following lines. You should edit the name value to what you want this server to be called in the Uchiwa dashboard. The name cannot have spaces or special characters. You can leave the address value set to localhost, since we are monitoring this Sensu client server. Enable and start the client. You should now see the client on the Clients tab on the Sensu Dashboard. Now that Sensu is running we need to add a check on both servers. We're going to create a Ruby script that will check if Apache is running. If you don't have Apache installed, install it now on both the Sensu master server and the Sensu client server. Apache should be running by default on both servers. Before installing the sensu-plugin gem, make sure you have all the required libraries. Install the Ruby libraries and the build-essential library on both the Sensu master server and the Sensu client server. Install the sensu-plugin gem on both the Sensu master server and the Sensu client server. Create a check-apache.rb file in the Sensu plugins folder and modify the file permissions on both the Sensu master server and the Sensu client server. Edit the check-apache.rb file on both the Sensu master server and the Sensu client server. Add the following lines, which script the process of checking Apache. Create and edit the check_apache.json file on only the Sensu master server. Add the following lines that will run the script to check Apache every 60 seconds. Restart the Sensu server and API on the Sensu master server. Restart the Sensu client on the Sensu client server. After a few minutes, you should see the check appear on the "Checks" tab in the Sensu Dashboard. Stop the Apache service on either server to test that the script is working. An alert should show up on the Events dashboard after a few minutes. Click on the alert to view more information and to take action such as silencing or resolving it. In this image, Apache has been stopped on the client server. This is the Clients page. Start the Apache service to stop the warnings. Handlers can send notification emails or send data to other applications like Graphite based on events. Here, we will create a handler that sends an email if the Apache check fails. Please note that your server needs to be configured to send email. On the Sensu master server, create and edit the handler_email.json file. Add the following lines, replacing email@address.com with the email address where you want to receive notifications. Depending on your mail server setup, it may be easiest to set this to an alias for a user on the Sensu master server. This handler is called "email" and will use the mail utility to send an alert email with the subject "sensu event" to the specified email address. "command": "mail -s 'sensu event' email@address.com"
Add the new handlers line with the email handler in the apache_check block. Stop the Apache service again to test the email alert. You should get one every 60 seconds. Start the Apache service again to stop receiving email alerts. Sensu is a versatile monitoring tool with its plugins and the custom scripts you can write for it. You can also create handlers to do almost anything with the data. Keep exploring to get it just right for you.